I’m aware that Ronnie James isn’t the only cat to ever do such a thing – this is no doubt a typical feline stunt. I hate to be one of those people always obnoxiously gushing about her cat’s intelligence, but sometimes I feel the need to indulge, especially when there’s photographic evidence. 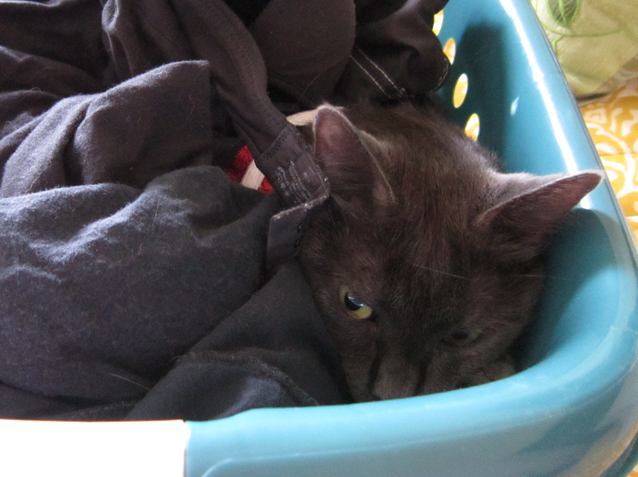 On Monday afternoon, I separated the dirty laundry into two piles, one of light colors and one of darks. I left the room for a minute, and when I came back, I found that Ronnie James had a). figured out which pile matched his fur, and b). inserted himself into the pile. 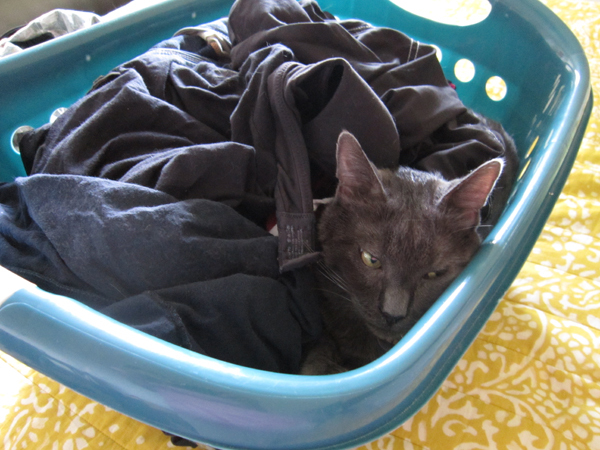 I don’t think he had any motive beyond demonstrating his ability to sort himself into the appropriate laundry pile… I mean, I don’t think he was trying to get out or to gain free admission to a thrilling ride in the washing machine or anything like that. He loves it here in the apartment, and he’s very good at bathing himself. He needs neither to escape nor to submit himself to the rigors of an industrial cleansing. No, it’s clear from the expression on his face that he’s just satisfied with his own analytical abilities. Bet you can’t find me, Mommy! He must get his camouflage talents from me. If there was a kitty Army, he’d join!